You need to make these tonight. 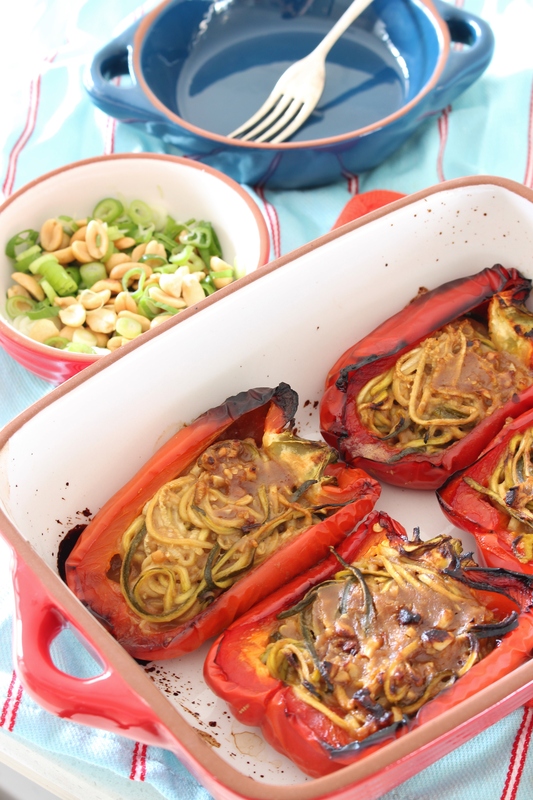 Spicy peanut sauce coats zucchini noodles stuffed inside sweet roasted capsicums for a vegan, gluten free dinner that tastes sinful, but is secretly healthy – and super easy! I love peanut sauce dishes. You can just put another notch in the ‘Things Amy loves that contain Peanuts’ list that I’m sure everyone is keeping. Basically the list reads: everything. If there is a way to add peanut butter to a dish I will find it. This dish is no exception. The peanut sauce that coats the zucchini noodles is everything a peanut sauce should be: deeply peanutty with a hint of sweetness, a dash of astringency, and a good dose of spice. I have so many memories of a peanut satay sauce that my sister and I were both in love with during high school. I don’t think either Mum or Dad were particularly fond of it, but they let us ride out our teenage cravings. Plus, they were getting dinner cooked for them, so I guess that was a win on their behalf 😉 Fast forward to today and I’d much rather create my own sauces than get them from a bottle – it’s all about customisation, and avoiding any unnecessary additives, right? And making your own spicy peanut sauce is easier than getting the ‘safety plastic’ off a shop bought bottle. Anyone else unable to get that stuff off? Just me? Moving on. Cut capsicums in half and remove seeds. Prepare noodles and sauce and mix. For those six simple steps you are rewarded with layers of flavour in every single bite. To take this to the next level I couldn’t help but garnish it with extra salted peanuts and some chopped spring onions for a little extra crunch. 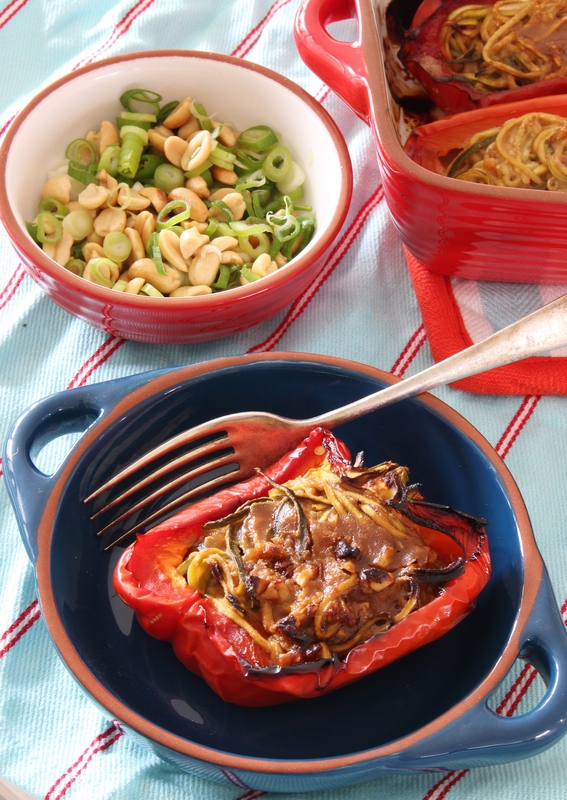 Every bite is a mouthful of molten sweet roasted capsicum, spicy peanut sauce soaked zucchini noodles, crispy spring onions and salty-crunchy peanuts. It’s everything a Wednesday night needs without being so heavy you want to hibernate for the rest of the week. Bonus: your kitchen will smell like the best Asian restaurant in town as these flavours mingle in the oven. Cut your capsicums in half and remove the core and seeds. I like to leave the little green tops because I think they look cute. 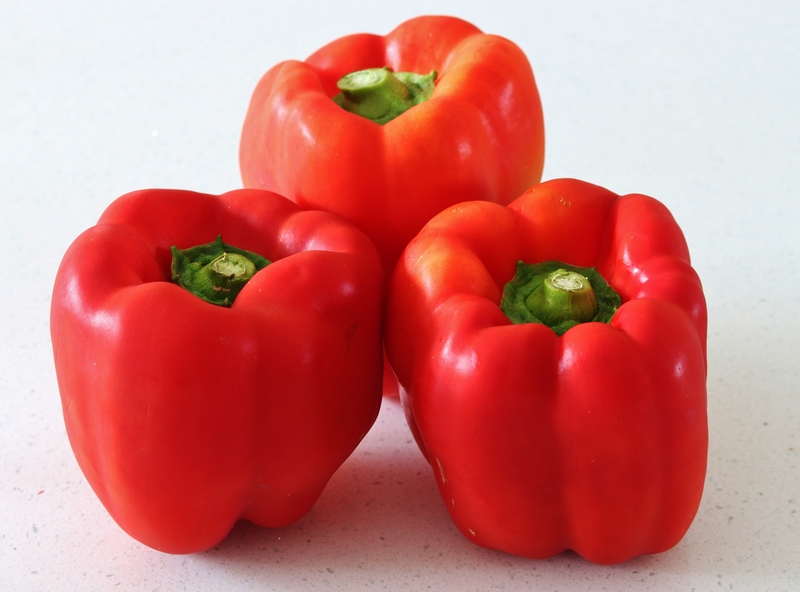 Place capsicum halves cut side down in an ovenproof baking dish. Mine was about 6 x 8 inches. Bake capsicums for 20 minutes and then remove from the oven. 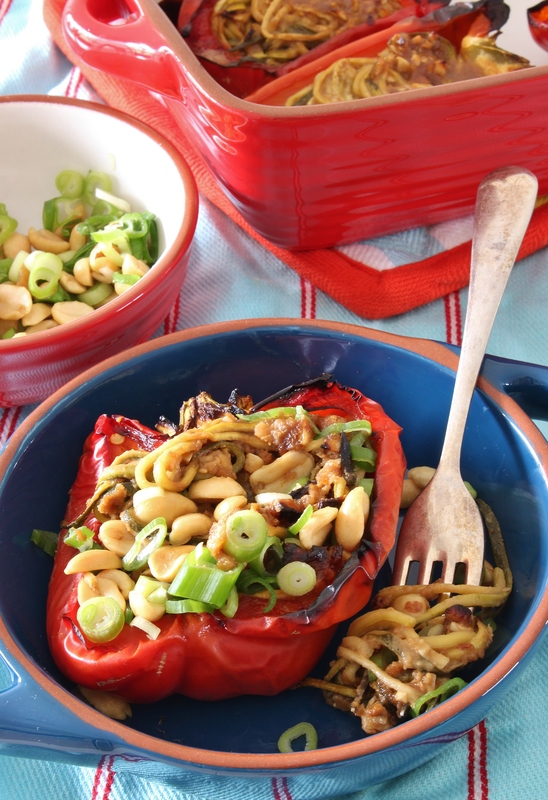 While the capsicums are baking, prepare your filling. Using a vegetable spiraliser or a julienne peeler create long thin ‘noodles’ from your zucchini. Crush garlic into a medium mixing bowl and whisk together with peanut butter, lime juice, brown sugar, grated ginger, and chili flakes. 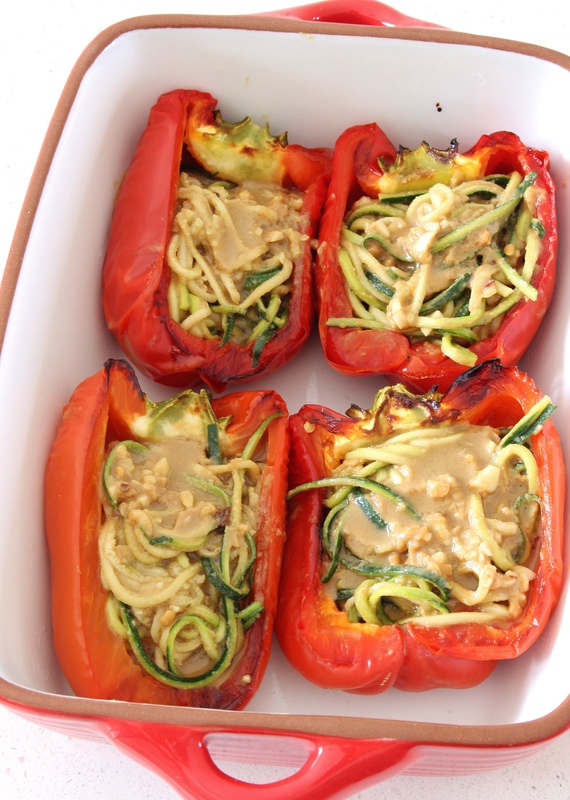 Toss zucchini ‘noodles’ with peanut sauce gently but thoroughly until they are coated in the mixture. Pile zucchini into capsicum halves. Spoon any extra sauce over the noodles. Bake for a further 20 minutes or until the tops of the noodles are golden. Remove capsicums from oven. 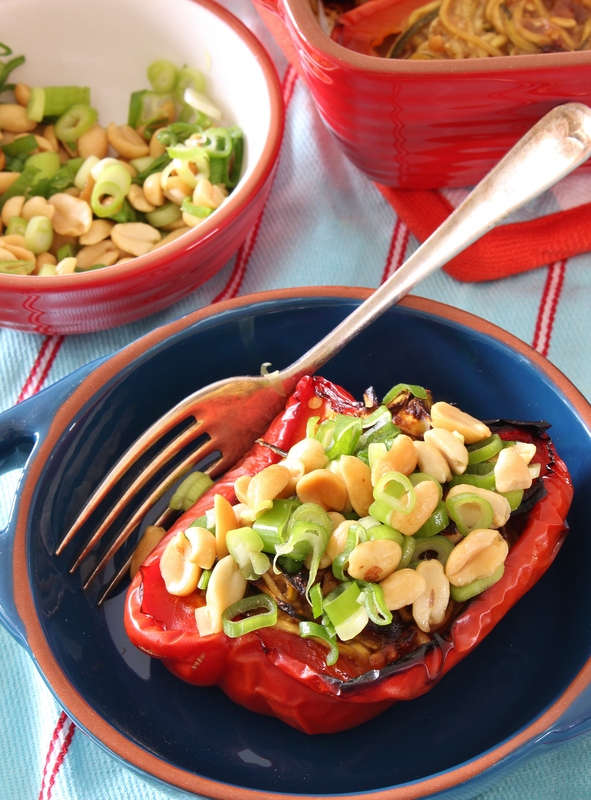 Toss together salted peanuts and spring onions and top the capsicum halves. Amy, this is like me dream meal! I love satay, love capsicum, LOVE noodles! I’ve never thought to combine it like this though, what a brilliant idea. 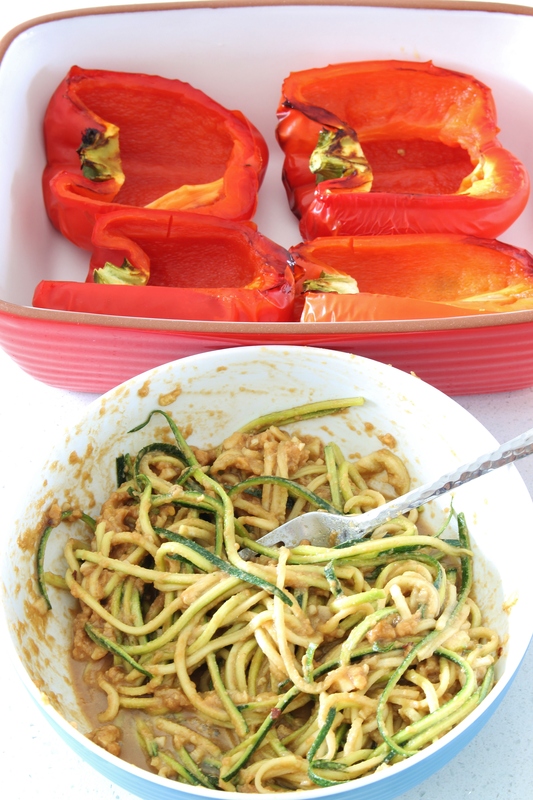 Peanut sauce and courgette is a fantastic combination! I love luuurve satay and baked capis too! Looks delicious. I’m a peanut fiend… A satay stalker. Trouble is, once I start, I can’t stop!!! I would totally eat the whole pan of these delicious stuffed morsels. Love, love, love. Y-E-S! Drench just about ANYTHING in peanut sauce and I am 110% in. You made me laugh so hard with the “‘Things Amy loves that contain Peanuts’….Basically the list reads: everything” comment. I’m RIGHT there with ya, girlfriend! Anthony will LOVE this one too – we’re going to have to make it soon. 'Life isn't about finding yourself. Life is about creating yourself'. ~ George Bernard Shaw. My name is Amy, and I am passionate about creating a thoroughly nourished life. I nourish myself daily with wonderful whole foods, a sprinkling of sweets, running, reading and writing. Here you will find a mix of gluten free and vegetarian meals and treats. I'm all about finding the extraordinary in the everyday. Come and join me at the table!